It's been a roller coaster of a time for the Veep cast and crew as they rallied around the show's star, Julia Louis-Dreyfus, who began treatment for breast cancer after announcing her diagnosis in September 2017. In the ensuing months, cast members like Tony Hale and Timothy Simons made videos to cheer her on, and HBO confirmed that it would postpone production on the final season of Veep until Louis-Dreyfus got well. Now, it's Louis-Dreyfus' turn to show her love and appreciation for her work family's constant support. 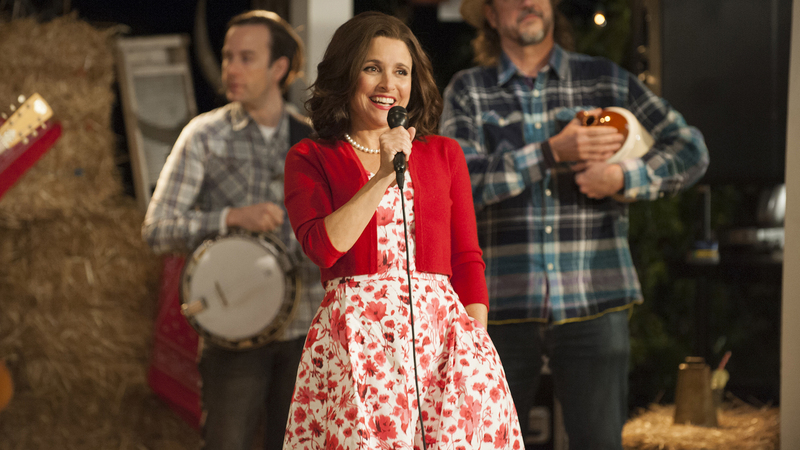 When rehearsals began for season seven earlier this week, Louis-Dreyfus recorded a video of her address to the Veep cast and crew before cameras began rolling. During her short speech, the Emmy-winning actor thanked everyone for all their support over the last 11 months. "I really appreciate everyone coming back and working it out to come back. I'm very grateful. Thank you very much. Love you guys," she remarked before cheerfully exclaiming, "Season seven!" This video is yet another instance of Louis-Dreyfus documenting all the fun she's having back on the Veep set, surrounded by her longtime friends. Since officially getting back to work on Aug. 9, Louis-Dreyfus has been posting fun photos and videos for her followers. In one video, Louis-Dreyfus, in full Selina Meyer garb plus a wig, carefully shaved off Hale's epic mustache. Both actors made deadpan comments about how the 'stache just had to go as Hale transformed back into his Veep character, Gary Walsh. It is so, so good to see Louis-Dreyfus looking radiant and readier than ever to dive back into work. She's fought so hard to get back to a healthy, productive place, and it looks like she has no intention of letting this streak of good luck slip through her fingers.